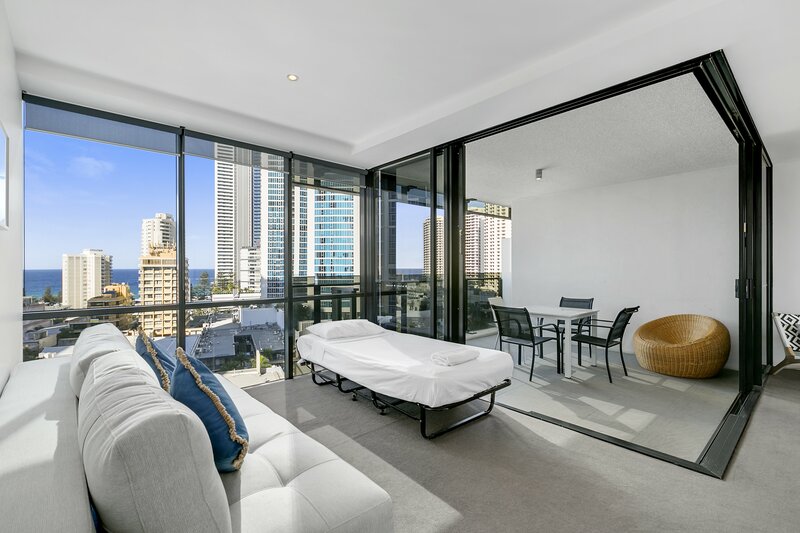 Circle on Cavill is idyllically located in the heart of Surfers Paradise. The 4.5 star resort is the prefect haven for families or groups looking for Gold Coast holiday accommodation that is within walking distance to the beach, local attractions and yet, still offers all the comforts of home. 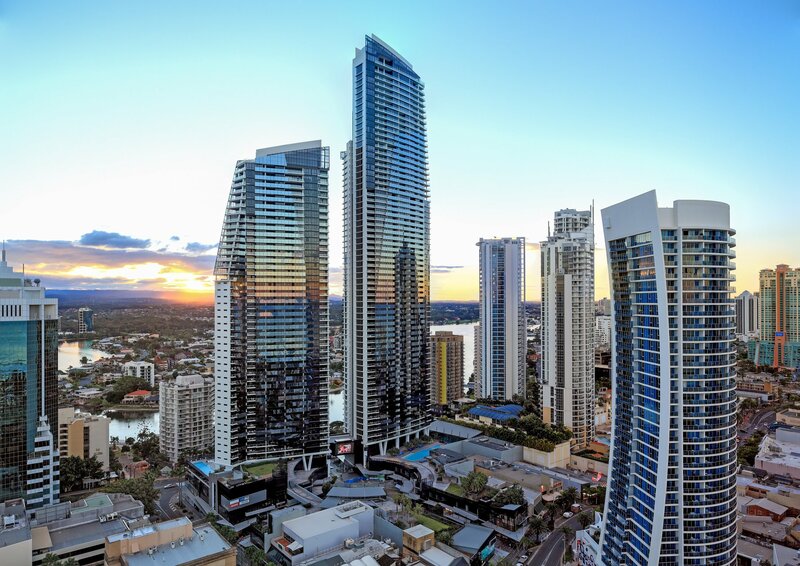 Circle on Cavill is located just a short 50 metre stroll to Cavill Avenue, 500 metres from the famous Surfers Paradise Beach and just a short ride on the Glink light rail will land you at Oasis Shopping Centre or Pacific Fair Shopping Centre. For those looking to shop locally, you won't have to go far. On-site, Circle on Cavill has its own shopping precinct where you'll find boutique shops and a variety of dining and entertainment options. The resort itself is just as impressive. Facilities include a lagoon style pool, a heated indoor lap pool, a sauna and spa, club lounge and internet lounge, barbeque areas, a private theatre, a games room and playground for the kids, child minding, a gym and even a tour desk. Wheelchair access is provided and the resort also offers babysitting services and a business centre with internet access. Everything you need for a hassle-free holiday can be found right here at Circle on Cavill. 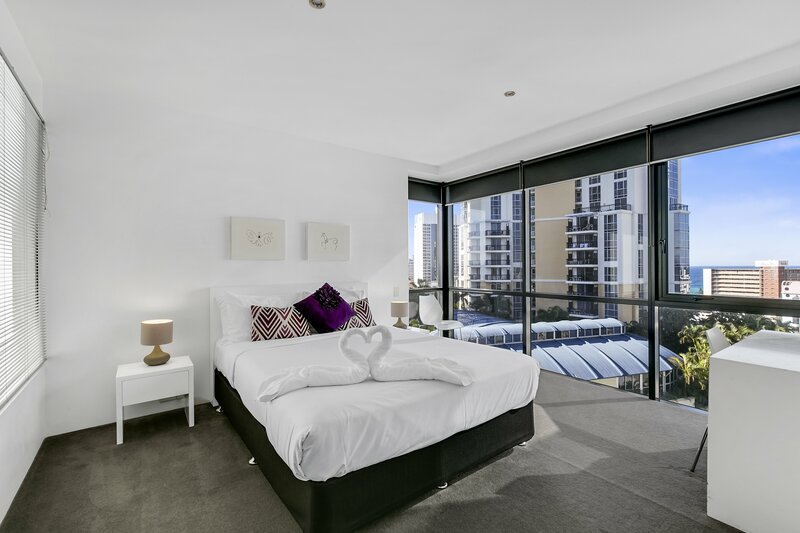 Apartment Overview For your Gold Coast accommodation needs, consider Apartment 2101 of Circle on Cavill. 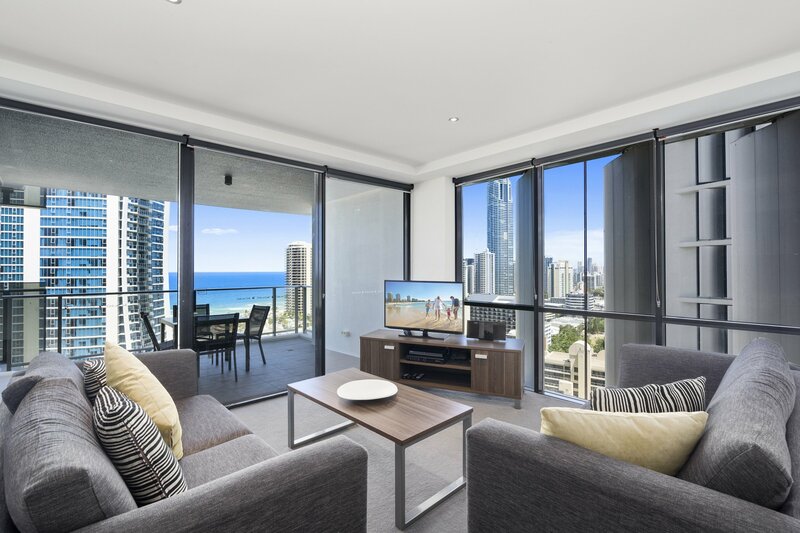 This privately managed 2 bedroom, 2 bathroom holiday apartment offers unbeatable value for small families or friends looking to enjoy a Gold Coast holiday. 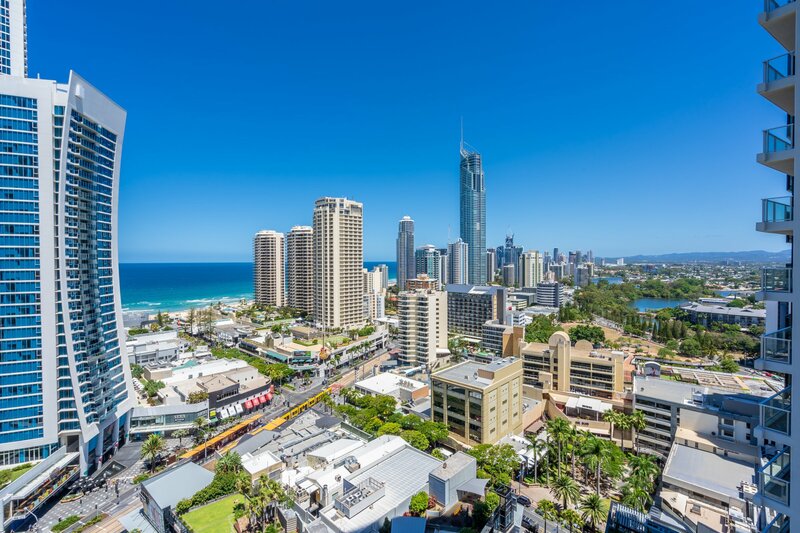 Located on the 10th floor of this popular Surfers Paradise resort, Apartment 2101 offers fantastic views of Surfers Paradise and the greater Gold Coast. The 140 square metre apartment exudes luxurious and spacious Gold Coast accommodation that is ideal for families or groups of friends. Apartment Features Apartment 2101 is fully air-conditioned and has been tastefully finished with modern fixtures including a large lounge, 6-seater dining table and a full-equipped gourmet kitchen, which offers all the comforts of home including a full-sized refrigerator/freezer, a microwave, a stovetop and an oven. Dine in and stretch your holiday budget further or exit the apartment and explore a smorgasbord of nearby culinary offerings - the choice is yours. Enjoy an alfresco dining experiece whilst relaxing on the large furnished balcony or dine in the separate dining area - luxurious floor to ceiling bi-fold doors enhance the view all the more. Other features of Apartment 2101 include a DVD player, entertainment system, flat panel TV, smoke detectors, sprinkler system, full laundry facilities, linen and because you're booking with GCHR, we'll throw in a free car park. Bedding Configuration Sleeping up to 8 guests (four included in the tariff, 4 extra available at a small fee), the master bedroom is configured with a queen bed whist the second bedroom offers 2 single beds. The master bedroom has its own ensuite with a spa bath which is perfect when sharing accommodation amongst friends. Both bedrooms are fitted with robes and offer fantastic views. Resort Facilities By booking Apartment 2101, you also get full use of the resorts facilities, which include 3 swimming pools, a heated lap pool, a spa, sauna and steam room, a gym and much more! 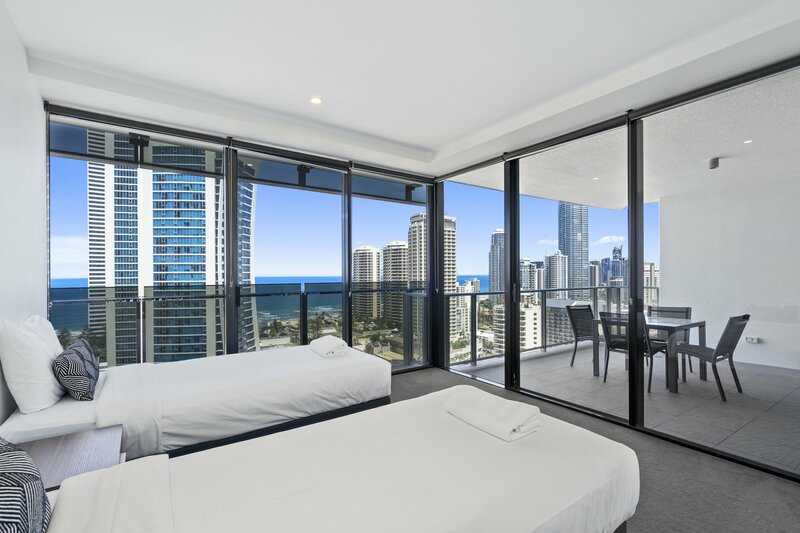 What more could you ask for your Gold Coast accommodation Nothing. All you need is right here at Circle on Cavill's, Apartment 2101. 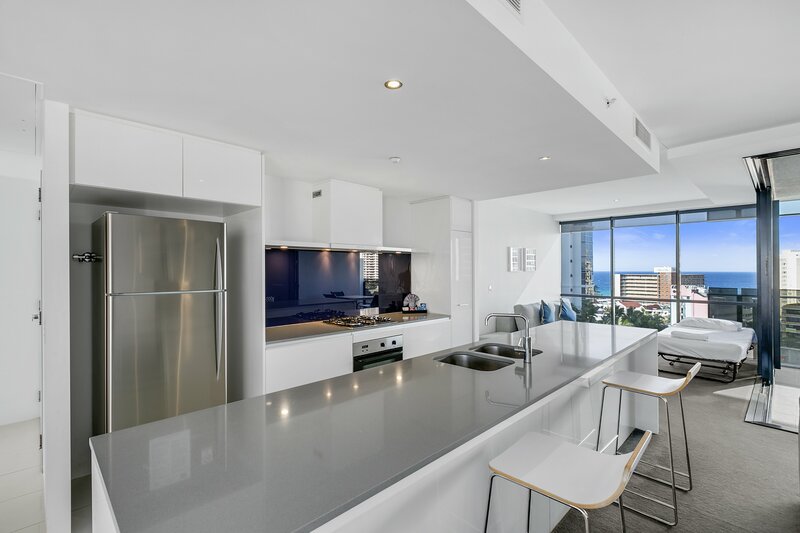 Apartment 2205 at Circle on Cavill is the perfect apartment for your Gold Coast holiday. 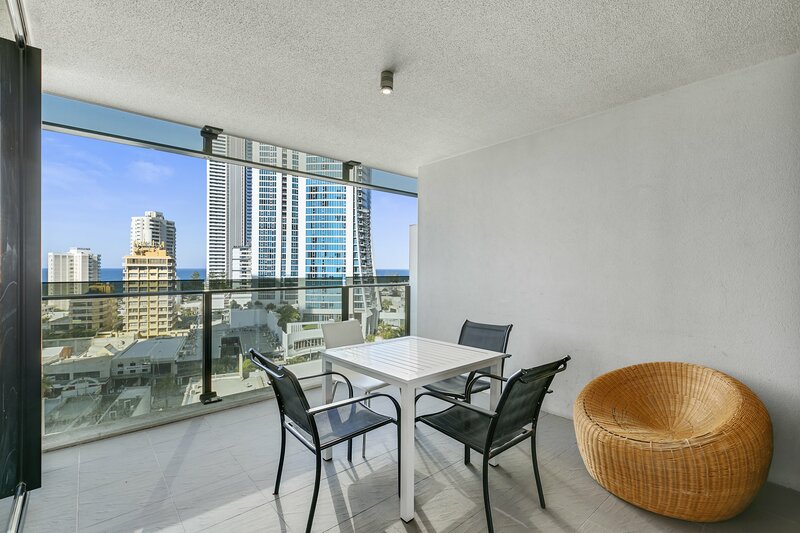 It is located in the heart of Surfers Paradise, just 600 mt from the beach and 270 mt from Cavill Mall. 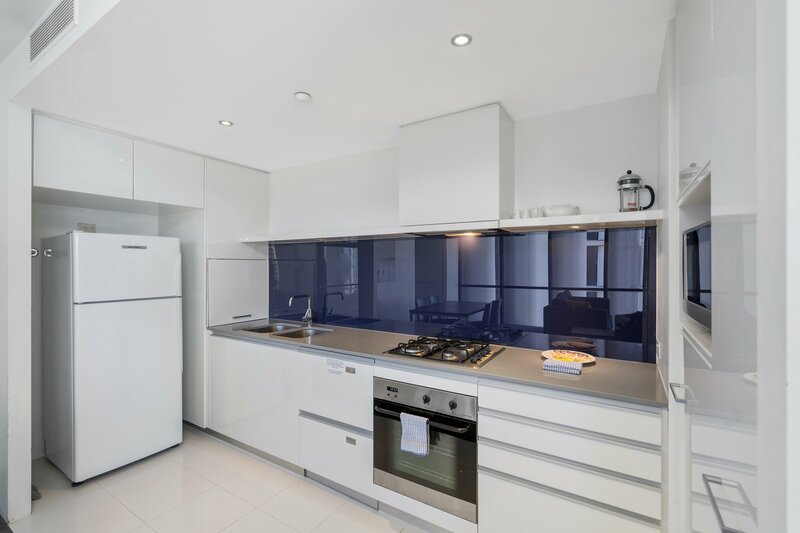 Apartment 2205 is a spacious holiday apartment that is located on level 20 of Circle on Cavill. 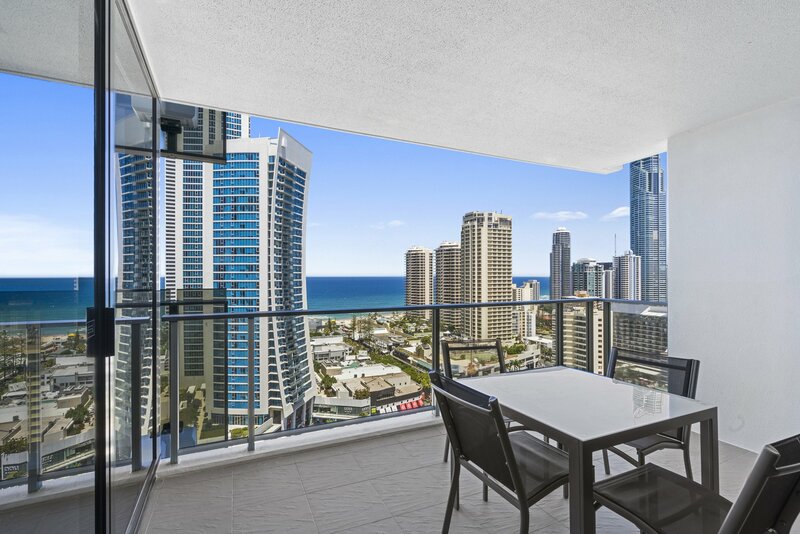 It offers fantastic views of the Pacific Ocean and Surfers Paradise and features 2 bedrooms and 2 bathrooms. It is ideal for families or small groups looking to share accommodation. Apartment Features The apartment boasts a contemporary design and modern interiors. It is fully air-conditioned and features a fully-equipped gourmet kitchen and a separate dining and living area. 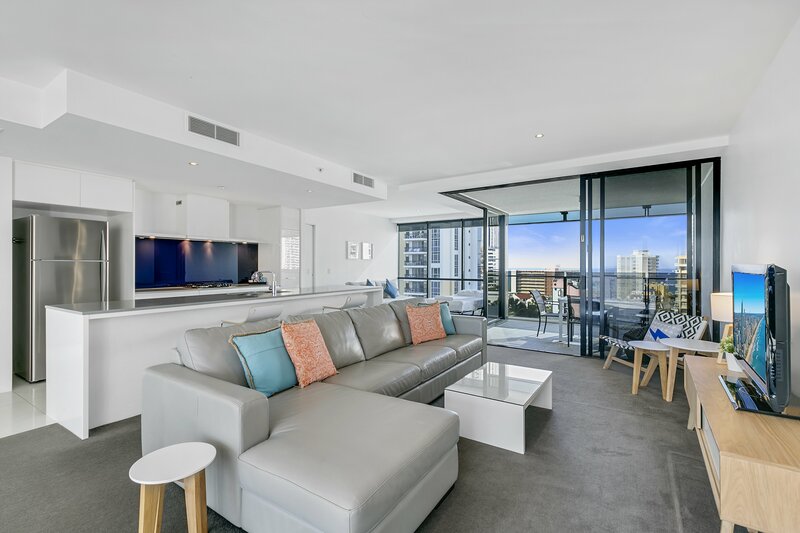 The living area features a flat-panel TV with Foxtel Premium and opens to a spacious, furnished balcony that provides spectacular views of the Pacific Ocean and Surfers Paradise. Bedding Configuration The master bedroom consists of a queen bed, walk-in robe and en suite spa bathroom. The second bedroom consists of two single beds and built in robes and offers balcony access. Both bedrooms offer great ocean views. Apartment 2205 is a 2 bedroom apartment which sleeps 4 in the tariff. 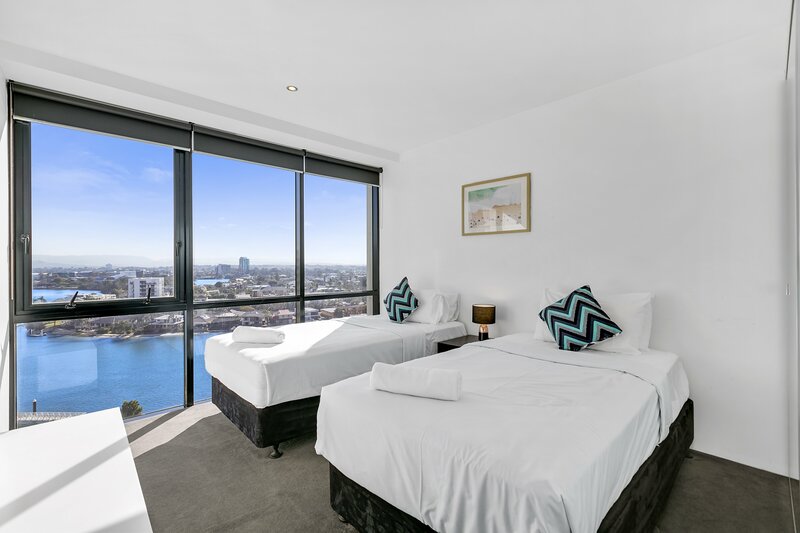 However, you can accommodate up to 2 extra guests by putting in a request at the time of booking the apartment and we will provide you with extra foldaway beds at a small additional fee. 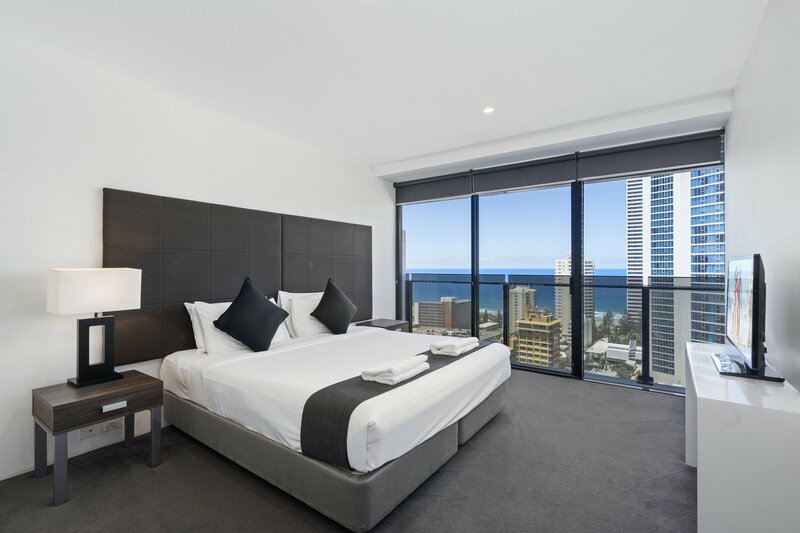 Resort Facilities Circle on Cavill is one of the most popular resorts in Surfers Paradise, and it offers great facilities for guests to enjoy. Some of the facilities to look forward to include 3 swimming pools, a spa, sauna and steam room, a gymnasium and BBQ facilities. Please note that your holiday apartment is managed independently from the resident on-site manager and staff. The resident on-site resort management has no responsibility for these apartments, and is not responsible for your booking or stay, including issues relating to check-in, check-out, cleaning, maintenance and parking. For any such issues, please contact us. We do not maintain an office at the property. We offer an express check-in service. Please download our app for smartphones at http//www.gchr.com.au/about-us/gchr-phone-app/ Available for iPhone and Android, the GCHR App offers real-time directions to and from our office, your accommodation and much more useful information. Key collection is available from 1.45pm (1345 hours) from our office on the day of arrival. 24 hour access. Guests will be provided (by email and SMS) with the access code (valid only for the day of arrival) to the key safe outside the office in the event that the office is unattended. Luggage storage may be available in in coin operated paid lockers, directly opposite the GCHR Office, in the basement entrance to the backpacker resort on 6 Beach Road, Surfers Paradise. Fees apply. Please note however these lockers will not fit large suitcases, surfboards or any other over size luggage. Circle on Cavill is located on Ferny Ave, 270 metres from Cavill Avenue and 600 metres from the beach. Circle on Cavill is north of the GCHR Office, which is located on the ground floor (street frontage) of the Cosmopolitan Building on the corner of Surfers Paradise Boulevard and Beach Road. The closest light rail station to Circle on Cavill is the Cavill Avenue station, which is located 240 metres from the resort on Surfers Paradise Boulevard.